TALLAHASSEE, Fla. (AP) Jacob Pugh has seen a lot in his four seasons at Florida State. What he has witnessed this season though has taken a toll. The senior linebacker vented his frustration on Monday. After being picked to win the Atlantic Coast Conference, the Seminoles are at the bottom of the Atlantic Division with a 2-5 overall record – including 2-4 in conference play. Florida State, which hosts Syracuse on Saturday, is off to its worst start since 1976 after a 35-3 loss at Boston College last Friday. Not only is Florida State’s string of 35 straight bowl appearances in jeopardy, but its string of 40 straight winning seasons is on the brink of falling too. Not only does it face an improved Syracuse squad, but there are challenging road games after that – Nov. 11 against sixth-ranked Clemson and Florida on Nov. 25. 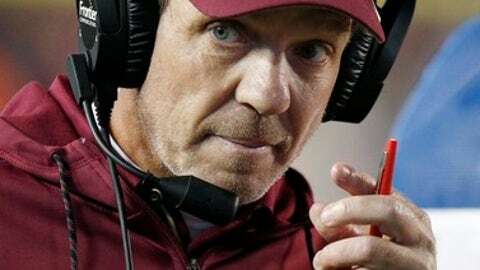 If coach Jimbo Fisher was hoping to keep his team from fracturing, Pugh’s assessment of what has gone wrong this season didn’t help matters. ”Lack of leadership, like coach always says, everybody is doing their own thing pretty much, I feel like everybody is worried about everything else,” Pugh said. ”A lot of players are probably worried about the draft or whatever else. It’s like nobody is really focused. Since winning 33 of 34 and a national championship from 2013 to the middle of 2015, the Seminoles have gone 16-10. They also are 9-9 during the same span in conference games. The biggest problems this season remain on offense, which has been decimated by injuries. The Seminoles are averaging 17.4 points, which is last among Power Five teams, and 335.6 yards per game, which is fifth-worst. The loss at Boston College marked the first time in 125 games (Sept. 20, 2008, vs. Wake Forest) that the Seminoles failed to score a touchdown. Fisher used most of Monday’s news conference saying that drastic changes are not needed either the rest of this season or in the future. He also tried to outline why he feels like his team is not that far off despite its record, citing last-minute losses to Miami and Louisville. Syracuse coach Dino Babers said he agreed with Fisher’s assessment. The Orange (4-4, 2-2) are coming off a bye week but have lost nine straight to the Seminoles and have never won in four previous trips to Doak Campbell Stadium.